To attend the wedding of William Beaumont to Gertrude Pratt we frocked it way up in vintage couture. Labels intact. One extra wore a satin-silk green ens2emble imported from the USA. You will see us outside the church. We look deeply authentic. After setting and wig fitting, then makeup, then costume, then back to hair to have our hats pinned to our scalps it was onwards to catering for brekky, then Lotte, our Casting Director, led the way to set. We wore slippers, carried our costume shoes in our bags with analgesics, lollies, water, tissues, phones, novels, playing cards and newspapers. 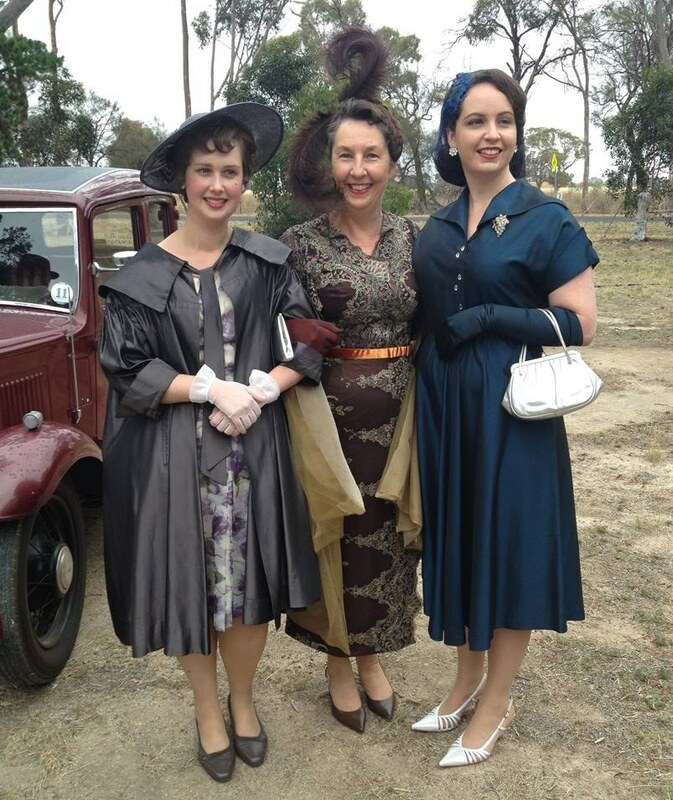 The cameramen set up, lay the tracks, then we are placed around the church to watch the guests arrive and alight their dear old cars – Elsbeth Beaumont with her cousin from Melbourne, Alvin and Muriel Pratt, Marigold and Evan Pettyman. We duly act ‘shocked’, ‘awed’, ‘appalled’ and ‘envious.’ Tilly Dunnage has made the frocks! They are beautiful. Then we move inside and sit in our pews, corsets biting, hoping Jocelyn calls ‘action,’ but the camera crew re floor the aisle (no creaks) then set up (again), re – measure, point lasers at surfaces and stick bits of paper on the walls. We don’t really understand the language those camera guys speak, but they move like oil around Don McAlpine and his complicated camera, and so we trust them. Then a seated dance moves around the body of the kirk, as though a mouse had scuttled through. The best man, Teddy McSwiney, has appeared next to William at the Alter. We try not to stare, but it is hopeless. Thankfully, Jocelyn calls action and Gertrude appears radiantly and Elsbeth finally looks pleased. After lunch (the food is always good), we change into somber funeral attire. Sergeant Farrat delivers the best funeral speech I’ve ever heard. Sadly, I didn’t write it. William Shakespeare did. I don’t protest. Then Tilly arrives, and they shoot a wrenching exterior scene with Barney but we were ushered away as apparently it’s hard to emote when several middle aged women in 50s frocks and hats, Ugh Boots and cardigans, mobile phones in hand haunt the actors’ sight-line. ‘But,’ we say to each other, ‘can’t he just act?’.